Ramon van Opdorp reports on the 2010 International Search and Rescue meeting, organized by the Belgian Air Component's 40 Squadron at its Koksijde air base near the Belgian coast. 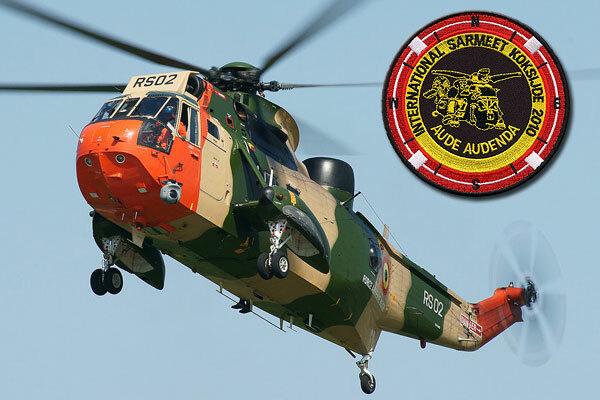 During the period of 17 till 21 May, the Koksijde airfield was host to for the annual SAR (Search And Rescue) meeting, welcoming some very special helicopters. 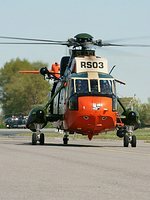 Units from all over Europe made the often long journey to the Belgian coastline to participate in SAR Meet 2010. The general perception of the public is often that Search And Rescue is solely associated with coastal countries. But most countries which are a member of the United Nations are equipped with a SAR unit, even when there are no coastlines. SAR units are used in a wide range of tasks and public services, the rescue of a wounded fisherman at a turbulent sea, the transport of a critically ill child to a hospital, the search and recovery of a crashed pilot, disaster relief, and so on. The tasks are performed under rules set by the ICAO and IMO (International Maritime Organization), however these rules are followed with a diversity in local organization and equipment. To overcome these sometimes large differences, a SAR Meet is held each year at a different SAR unit base. The common goal among the participants is to get acquainted with each other’s skills and expertise levels, the different equipment and techniques used, and to build or enforce the camaraderie between all participating countries. The SAR meet is not organized to provide a general meeting on rules and procedures alone, each unit is also put to the test on various specific tasks. 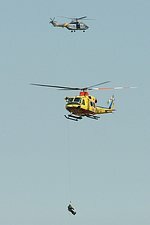 The pilots have to show their precision flying skills with the helicopter for example during the winching contest, the navigators need to accurately guide the pilots to exact location at open sea or the isolated spots near the coast or overland, and the rescue divers/medics are put to the test during the survival test. Of course, the exercises also test the technicians responsible for the overall operation and state of the helicopter and its equipment.. Like one well-oiled machine, all the unit’s members are working together to achieve the goals. 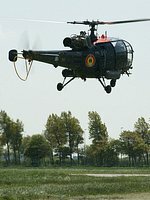 During the run-up to the SAR Meet 2010, the Belgium Air Component’s 40 Squadron invited nine teams, from eight different countries. 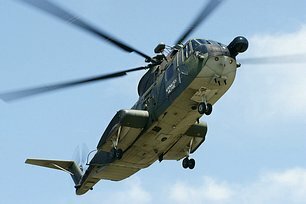 Together with the two Belgian teams, this would have resulted in an impressive list of eleven different SAR helicopters. However, three teams had to cancel their participation at the last moment, due to different reasons. 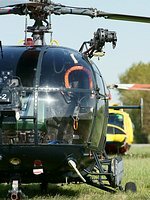 This included RAF 20 Squadron (Seaking HAR.3), and the French Flotille 35F operating the Eurocopter SA.365N Dauphin, which was high on my personal “to see” list. The third cancellation came from the Czech 243 Vrtulníková Letka, unfortunately I thus missed the opportunity to see its PZL W-3A Sokól. Nonetheless, there was still a exciting group of helicopters that made their way to Koksijde. As host of the SAR Meet, the Belgian 40 Squadron was naturally participating with their Seaking Mk.48, while the neighbour Navy squadron Heli Flight Marine was present with one SA.316B Alouette III. The Dutch 303 Squadron from Leeuwarden was present with one of its Agusta-Bell AB-412SP, also known as 'Tweety' because of its striking yellow coat, which made it the most colorful participant. 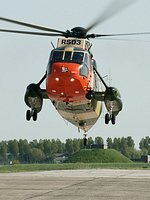 From the Kiel-Holtenau base in northern Germany, a Seaking Mk.41 , was present. While France send a SA.330B Puma which is normally performing the SAR duty in the airspace around the port city of Bordeaux from Cazaux air base. For me personally the next three helicopters were the most interesting. Starting with the SA.330J Puma belonging to the Escuadron 801 Salvamento, based at Mallorca, Spain. 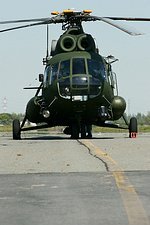 This Spanish SAR Puma can be distinguished from other Pumas by the two bright yellow stripes on the tail boom. Secondly, the Italian HH-3F Pelican, Belonging to the 83° Centro CSAR, which is based at Rimini, but will soon be moving to Cervia (see also our report here),The HH-3F ‘Pelican’ was a welcome sight, as they are not often seen at events outside Italy. And topping the list of what I consider quite exotic participants was a Mil Mi-8RL ‘HIP’ of the 3. Grupa Poszukiwawczo-Ratownicza (3rd SAR Group) from Krakow, Poland. This beast was the largest participant of the meeting, with its impressive rotor span of nearly 22 meters. As mentioned previously the SAR Meet includes a certain level of friendly competition between the participating countries. The winners were announced on Wednesday after the winching contest. With some very large helicopters in the air, flying over your head at no more than 5 meters creating quite some downwash, photographing was challenging, but rewarding with constantly changing angles to photography the helicopters from and especially with having the opportunity to photograph the Mil Mi-8 ‘HIP’, SA.330J Puma and a HH-3F ‘Pelican’ in the air. Special thanks to the Koksijde 40 Squadron and Stephane Lowagie for their hospitality, efforts and generous assistance in making this feature possible.